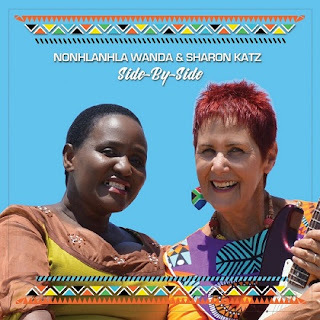 Join Sharon Katz & Nonhlanhla Wanda’s 25th Anniversary Creating Music Together when they visit Durban on February 16, 2019. Musician/humanitarian Sharon Katz (originally from Port Elizabeth) and singer/teacher, Nonhlanhla Wanda (from Durban) celebrate 25 years of worldwide touring and musical collaboration. Some of the celebration includes duo shows in South Africa with performances in Johannesburg, Durban and Cape Town. The tour begins with a concert with the legendary diva Abigail Kubeka at Sophiatown TheMix on February 9 and will be followed by concerts in Durban and Cape Town. The international performers recorded their current album Side-By-Side with producer Malcolm Nhleko of Maltre Studios. The Afro-Jazz-Contemporary fusion album features all original compositions by Wanda and Katz and showcases their distinctive voices and gorgeous harmonies complemented by the instrumental virtuosity of Sharon on guitar; Qhubekani Mthethwa on bass; Charles Boykie Mnomiya on drums; and Sanele Phakathi on piano and synthesizer. Katz and Wanda are also the subjects of the multiple-award winning film, When Voices Meet” It documents the role of The Peace Train in creating South Africa’s first, 500-voice multiracial youth choir in KwaZulu-Natal in 1993; its groundbreaking concert tour across the country in support of the first democratic elections; The Peace Train’s first tour of America after President Mandela was elected; and the long-term impact of the project as told by the participants 20 years later. The film, which premiered at the Durban International Film Festival, has won awards at over 30 film festivals around the world and been broadcast in over 50 countries. John Kani and Abigail Kubeka are also featured in the film. In 2018 The Peace Train initiated a multi-national project called Transcending Barriers which is designed to foster peaceful relationships between the countries of Mexico, Cuba, South Africa and the USA. In June 2019, Katz will perform with 2,000 children in Tijuana Mexico, and in November she will present a full production featuring Cuban, South African, American and Mexican children at the 33rd International Choir Festival in Santiago de Cuba. The duo contributes proceeds from their concerts and CD sales toward social development projects in South Africa, including supporting a children’s home, bursaries for orphans, after-school cultural programmes, and therapeutic music projects across the country. Katz will also join Mlungisi Gegana in concerts to benefit the Mlungisi Academy in Queenstown. Katz and Wanda with full band will perform in Durban on February 16, 2019, at the Moyo Restaurant at uShaka Marina. Reservations for dinner: 031 332 0606.